I have been dipping into my family history on and off for over 30 years, and with most of my paternal ancestors coming from Kent they are the ones I know most about. Click here to read about them. My maternal ancestors were from Somerset, Worcestershire and Ireland. I belong to both Kent Family History Society and North West Kent Family History Society and am currently Hon Secretary of Kent Family History Society. 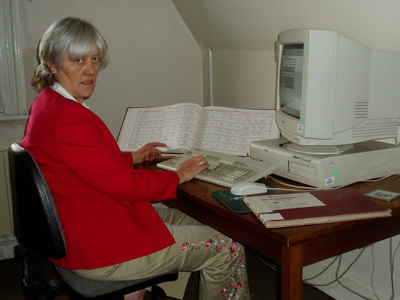 For several years I was part of the team of volunteers from Medway branch of KFHS who indexed all the old birth and death registers held at Medway Register Office. not normally seen by the general public so it was a great priviledge to be part of that team. and we progressed to a slightly newer computer and screen to work with. When I first visited Maidstone Archives I handled the actual parish registers but as demand increased and technology developed the books were all been filmed to avoid damage from overuse and many have been transcribed and indexed. This means that parish registers are in many cases readily available at LDS Family History Centres around the world, though the actual books now are seldom seen. Rochester Archdeaconry Parish registers are now digitized and images of the actual registers are available on-line at CityArk Imagebase. Kent Registrations Services have an on-line search facility for marriage certificates 1837 - 2002 (and birth and death certificates 1992 - 2002). If you find a likely marriage you can often establish the place of marriage before ordering the certificate. With the help of KFHS and NWKFH email groups I have started to compile a list of the various marriage register codes. Click here for an Excel file of containing a partial list of the Register codes. About 65kb and takes about two seconds to download with 512 broadband. If you have a certificate with a register code not included in the list please e-mail me and I will add it to the file. There are still lots of gaps! However, it seems clear that all the Registration districts have one or more series of Established Church (CofE) marriage registers and another series of Register Office and non-conformist churches all together in the same register, though it's not clear yet whether there were separate registers for the Register Office ceremonies. Please note that this index covers the present Kent County Council area, and does not include Medway or London boroughs that used to be part of Kent. Also I've been informed of a number of marriages that cannot be found this way, even though certificates have been issued, so the Kent Registration Service database is not complete. See the step-by-step example to find my gt grandparents' marriage.